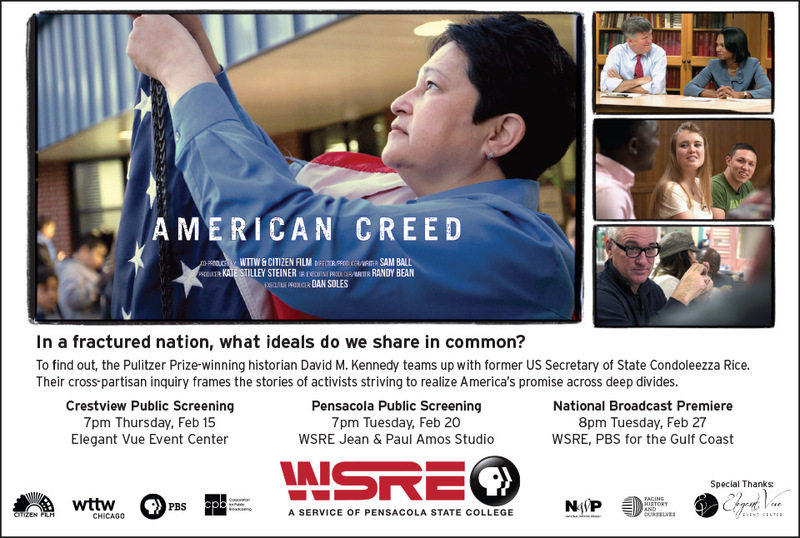 WSRE was one of ten public television stations selected for hosting community events in conjunction with the national premiere of “American Creed.” The public is invited to attend advance screenings of the film in Crestview and Pensacola and to contribute to the national conversation sparked by the film by submitting digital video stories. Two unlikely collaborators, Pulitzer Prize-winning historian David M. Kennedy and former U.S. Secretary of State Condoleezza Rice have teamed up to investigate the idea of a unifying American creed. Through stories from around the country, the documentary American Creed wrestles with immigration and assimilation; the dwindling economic prospects of many people in a nation that aspires to opportunity for all; the notion that individual ambition and achievement can raise up communities; and the meaning of citizenship and the challenge of meaningful civic participation and dialogue. Featured in the film are Chicago Cubs baseball manager Joe Maddon, who became a civic activist after a controversial immigration ordinance was passed in his Pennsylvania coal country hometown; U.S. Marines veteran Tegan Griffith, who advocates for fellow veterans and the working class; Deidre Prevett, a Muskogee Nation, Oklahoma school principal who fights for low-income children; and entrepreneurs Leila Janah and Terrence Davenport, who have worked to create economic opportunity in the Arkansas Delta, where the legacy of slavery and sharecropping persists. WSRE is providing educators in Escambia, Santa Rosa and Okaloosa Counties with resources to facilitate and engage their students in classroom discussions. Click here for the toolkit. Through these events and broadcasts, WSRE is facilitating the sharing of local stories of citizenship and community building.